This Christmas, we are celebrating with not just one, but two new kittens in our family. Every morning I check to see what they got into during the night. Which ornament, which light strand, which bit of garland, which wise man have they pulled down or knocked down. I have stopped one kitten from climbing up the middle of our Christmas tree on several occasions and rescued this same kitten when his claws got stuck to the garland and lights strung over a door. He was hanging from them like a mountain climber repelling off a mountain. Wrapping paper is their favorite closely followed by empty boxes and ornament hooks that they’ve detached from the ornaments they’ve knocked to the ground. Oh, Christmas is a wonder of excitement to these two little guys and they are certainly keeping me on my toes. The purpose of Christmas, the very heart of God’s heart in sending His Son, is peace. It is RECONCILIATION. We adopted our new kittens from the Humane Society. They apparently had been dropped off at the shelter together. They spent time in a cage together there before spending the next several weeks of their lives on display at a pet store in a different cage—still together. We kept going to the pet store for supplies for our other animals and seeing these two playful kittens. Why weren’t they getting adopted? Finally, we decided we needed to be their family only to learn as we signed our name to the adoption papers that others had been interested in taking one of the kittens, but never both of them. Until us. That was what the Humane Society had been looking for the whole time, a family who wanted to keep the kittens together since they’d never been apart. And we see this at work in these little guys. The very first week we brought them home, they were getting bolder, adventuring into new places around our house. Then we heard the crying. It was the saddest, quickest succession of meows we had ever heard, not a hurt cry, but a deeply sad cry. One lone kitten walked by, meowing as he searched from room to room for the other kitten. Even now, after almost four months with us, if one kitten can’t find the other kitten, we hear the crying and we watch the searching. I’ve been meditating this Christmas season on God’s heart for Christmas, the lengths He went through to reach us and bring us back to Him. His divine plan initiated in the Garden of Eden was this: the moment we chose sin, He made provision for grace. He began preparing the world for its Savior, Jesus Christ, to bring reconciliation. Then the appointed time came, after waiting and waiting, after anticipation and heartbreak, after God’s faithfulness despite His people’s unfaithfulness. Jesus was born, a tiny helpless baby born to a poor, seemingly insignificant couple in the lowest of circumstances—surrounded by animals, hay, and the scent of a barn. The prophet Isaiah had promised that He would be the “Prince of Peace” (Isaiah 9:6). Jesus brought peace, and Jesus is still bringing that yet-to-be-attained peace. We were divided from God, cut off from His presence. Sin disrupted our relationship with Him, but grace bridged the gap. Through Jesus, we can be at peace with God. Paul tells us that God brought us peace, so we now bring peace. We are ambassadors to the world, carrying the message and ministry of reconciliation so that others can be made right with God. Jesus’s heart is for peace: Peace between us and God, peace between us and others. He says, “Blessed are the peacemakers, for they shall be called sons of God” (Matthew 5:9 NASB). Peace is the heart of our Prince of Peace. Peace is the fruit I bear when the Spirit is at work within me. Am I bearing this fruit? Peace-making is a sure sign that I am His Child. Can others see His heart for peace in me? We do celebrations in our family. We celebrate first days and last days, pick-me-up treats on the hardest days, victory treats when we have a big win and even sometimes just for trying.because we know trying requires courage. My daughter has a competition this weekend, but I’ve already let her request her “celebration dinner,” whether she comes home with first place or last place. We’re not saluting the prize, we’re saluting the effort, the time, the commitment, and being done, of course. Our celebrations aren’t elaborate or Pinterest-worthy. We make a special batch of cookies or stop in at 7-11 for a Slurpie, cook up a special dinner or maybe even get milkshakes for a “big” treat. We “party” with family movie night and a bowl of popcorn or head to a beach or a playground for some afternoon fun after a week of testing at school. I’ve even been known to happy dance in the kitchen occasionally, (which is instantly embarrassing to my children). But that day, my daughter climbed in the minivan after school and asked for a treat because it was Tuesday. Well, maybe we’re stretching our rejoicing habits a bit too far if we’re now celebrating specific days of the week just because they exist on the calendar. Can we celebrate because we had a good day? Can we have a treat because we had a bad day? Can we have a treat because…it’s Tuesday? We all have a good laugh because this is who we are: We’re celebrators and rejoicers. We’re joy-seekers. I love that God gives reason to rejoice. Not just that, He compels us to rejoice. In Romans, Paul tells us that we have peace with God because of Jesus. We’re justified by His blood and saved from the wrath of God. 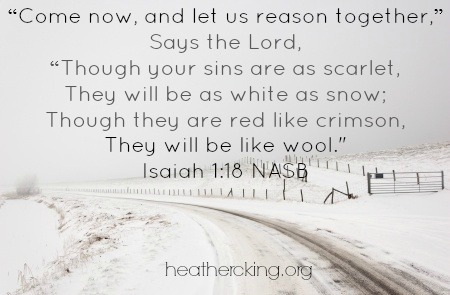 He reminds us we were God’s enemies and yet, because of Jesus’s death, we’re now reconciled with this perfect, holy God. But Paul tells us what is the greater thing. We recognize His holiness and our need for reconciliation. We recognize we were enemies of God and yet now we have peace with God. We recognize all of that…. “More than that, we also rejoice in God through our Lord Jesus Christ, through whom we have now received reconciliation” (Romans 5:11 ESV). We rejoice because Jesus has done the work. We believe in Him as our Savior, we place our faith in Him as our Lord, and He has reconciled us to the Father. So, we don’t need to drag around shame; we can lift up praise. We focus more on our Savior than we focus on our sin. The note in my Bible says, “Christians GO BEYOND avoiding God’s wrath and actually rejoice in the same God who would pour out wrath on them were it not for Christ” (ESV Study Bible). Our faith is about more than just avoiding the wrath of God; it’s celebrating the good news: Jesus made us righteous by covering us with His righteousness. And, God Himself rejoices. Maybe recapturing the image of God and all of His joy reminds us to have joy, too. He will delight in you with singing.” (Zephaniah 3:17 CSB). We are unworthy, and yet He loves us. He finds joy and takes delight in us. And it is His joy, His deep-hearted gladness, that we can cling to when we’re overwhelmed by our own sin. In the book of Nehemiah, the people were moved to mourn when they heard Ezra the priest read from the law. They saw all of their unworthiness and all the reasons for their exile. This day is holy to the Lord your God. Do not mourn or weep…today is holy to our Lord. Do not grieve, because the joy of the Lord is your strength (Nehemiah 8:9, 10). Rejoice today. Celebrate. Praise Him. He loves you. He died to save you. Her rejoices over you. Such love deserves a celebration. At home later, they do what big trucks should do. They push tiny objects off the living room table and onto the floor. They blaze trails through toys and flatten ground. If it’s big and makes noise, he loves it and knows what it’s called. I don’t know what it is about these trucks that hold this little man’s attention so, but I know why suddenly, after a lifetime of not caring much about them, I find myself newly impressed. And maybe that appeals to me because I need some “ways” right about now. I need some impossibilities cleared, some unlikely provisions, delivered, and some mountains moved. We can look at circumstances: at bank accounts and how the numbers don’t add up, at agendas and jam-packed calendars, at job expectations and the number of hours in a day. No way for hope. No way for rescue. No way for there to be enough. No way for the good and the beautiful to come out of this rotten mess. But here’s the good news: We serve a God who makes ways. He parts waters so his people can walk straight across a sea on dry ground. He leads the nation through the wilderness and all its enemies. He strikes down evil kings and raises up righteous ones, He rescues His people from annihilation over and over again. and a path through rough waters. They fell together and will never rise again. They were destroyed as a flame is put out. 19 Look at the new thing I am going to do. It is already happening. Don’t you see it? and rivers in the dry land. (Isaiah 43:16-19 NCV). No way out of the mess you’re in? No problem. Not for our way-making God, the One who makes paths through the desert and springs up rivers from the dust. Today, I read once again about the biggest impossibility of all. no one can be made right with God by following the law. The law only shows us our sin. There’s the obstacle of our sin, that huge mounding imperfection blocking us from right-standing with God. We can’t be good enough. Not ever. So, what’s a sin-prone girl like me to do? Try anyway? Steep myself in rules, have-to’s, must-do’s, traditions, and legalism? Or maybe give up? Throw in the towel? Just do whatever I want because I can’t ever attain that perfection? 21 But God has a way to make people right with him without the law, and he has now shown us that way which the law and the prophets told us about. 22 God makes people right with himself through their faith in Jesus Christ (Romans 3:21-22 NCV). He bulldozes over the problem of sin. He plows through the strictures of the law and he lifts into place the weighty foundation of grace in the form of a cross. And if He can do that, if He can make this astoundingly miraculous path to forgiveness and grace even when I didn’t deserve such rescue, I know I can trust Him in my every impossibility, my every hopeless situation, my every closed door, my every mountain of a problem. He can make a way. You were bought with a price; do not become bondservants[a] of men. But when the set time had fully come, God sent his Son, born of a woman, born under the law, 5 to redeem those under the law, that we might receive adoption to sonship. who is a deposit guaranteeing our inheritance until the redemption of those who are God’s possession—to the praise of his glory. He did not enter by means of the blood of goats and calves; but he entered the Most Holy Place once for all by his own blood, thus obtaining eternal redemption. For you know that it was not with perishable things such as silver or gold that you were redeemed from the empty way of life handed down to you from your ancestors, 19 but with the precious blood of Christ, a lamb without blemish or defect. “For God so loved the world, that he gave his only Son, that whoever believes in him should not perish but have eternal life. 17 For God did not send his Son into the world to condemn the world, but in order that the world might be saved through him. For while we were still weak, at the right time Christ died for the ungodly.7 For one will scarcely die for a righteous person—though perhaps for a good person one would dare even to die— 8 but God shows his love for us in that while we were still sinners, Christ died for us. 9 Since, therefore, we have now been justified by his blood, much more shall we be saved by him from the wrath of God. 10 For if while we were enemies we were reconciled to God by the death of his Son, much more, now that we are reconciled, shall we be saved by his life. I found a $1 treasure at a summer yard sale, an oak step stool to solve my problem. My kids had been scaling the counters to reach cups and bowls from the cabinets, a heart-stopping feat if ever there was one. They carried the bathroom stool out to the kitchen and left it there where it didn’t belong. It was a step stool in demand, actually. Every time we needed the stool, it was inevitably hopelessly lost in whatever room in the house we didn’t think to look. I spotted that “new-to-us” wooden stool in that yard sale and my heart skipped happy beats of victory and accomplishment. With just a simple coat of paint, I’d have a sturdy new stool that belonged in the kitchen, kept my kids off the counters, and matched my home décor. The first time it wobbled, we dismissed it as our own clumsiness. That’s easy to do in our house. But the offending stool failed us again and again, causing bruises, bumps, scrapes, tears and accusations. The problem, though, wasn’t our technique. The stool itself was faulty in a way a coat of paint couldn’t cover. It was treacherous and off-balance. Finally, I admitted defeat and threw it out with the morning garbage before I added an emergency room visit to my daily agenda. 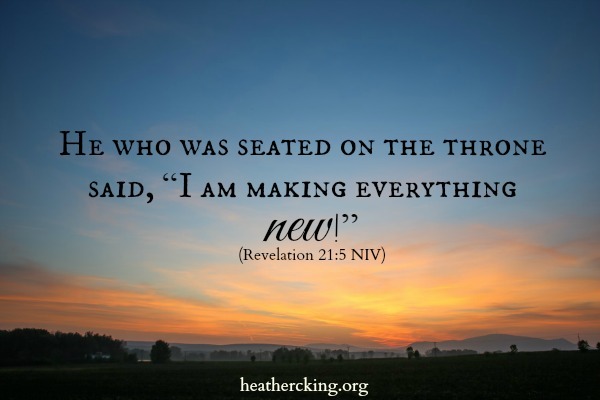 My refurbishing failure reminded me that Christ doesn’t just make things over, He doesn’t just make things pretty, He makes all things new. More than that white covering of snow that sparkles in the moonlight and hides the wilted grass and un-raked leaves, Christmas offers us a fresh start. But do we believe it? Do we treat ‘newness’ as little more than cosmetic refurbishing? A coat of paint, perhaps, and God sends us on our merry way with a façade of Christian niceties covering over a truly treacherous human condition? Therefore, if anyone is in Christ, he is a new creation. 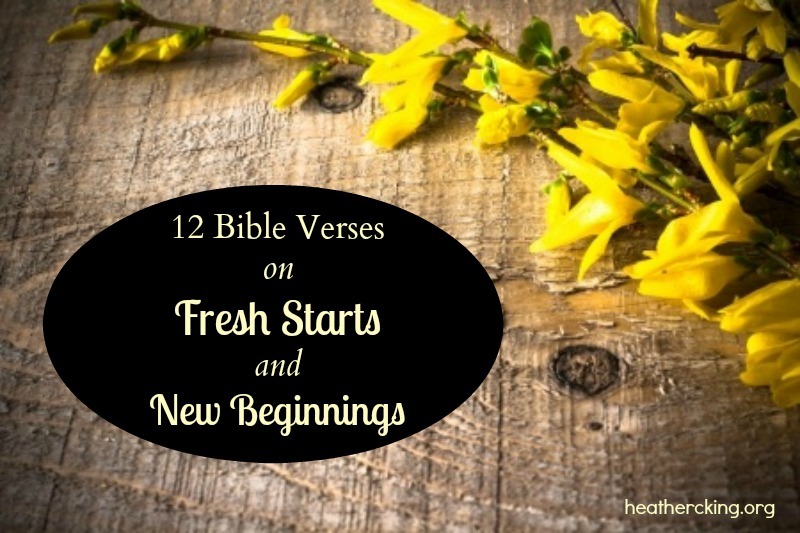 The old has passed away; behold, the new has come (2 Corinthians 5:17 ESV). God’s work in us isn’t just life with a Christian ‘varnish.’ He promises to remove the diseased and petrified heart that plagues our life with sin and transplant in us a new heart of flesh, a heart where His Spirit dwells. It’s complete. It’s not refurbishing a $1 step stool and hoping you don’t gash your head open when you use it. It’s not ‘settling’ for a little bit of God in a big pile of mess. More than this. Oh, so much more. It isn’t God handing us a 12-step instruction sheet with complicated diagrams and a paint kit and telling us to go make a new heart. That’s the law. That’s us trying to get it all right. Trying to be perfect. Trying to reach heaven on our own tip-toes (maybe with a faulty step-stool). That’s us landing on the ground again, worn and weary, exhausted from trying so hard to stop the wobbling, the failure, the mess the brokenness. That’s us trying to hold it all together and still finding that it falls all apart. But Christmas is God come down; not us reaching up high enough to touch Him. Christmas is God’s gift, God at work, God-with-grace, God-with us. Too often, we make it all about us. What we have to do to make Christmas perfect. What we have to accomplish in our homes and in our hearts: The projects, the parties, the get-togethers, the programs, the traditions, the attempts to pack more meaning into something so deep-down meaningful. He will take us as we are and He will make us new. It’s all in His big hands, big enough to hold us all together, big enough to heal, strong enough to carry us right on through. I froze on the sidewalk in the scorching summer heat with a six-year-old by my side and a toddler in the stroller. We had popped into a grocery story 45 minutes from our home on a whim and then just as spontaneously decided to walk down to the Subway for lunch. Nothing about this day was planned out or scheduled. We could have just as easily been anywhere else at that moment. But it was in that moment and there in that place that a stranger flew out of the doors of one of the storefronts, cigarette and phone in her hand, screaming at the air. When she collapsed to the ground and cried so hard she almost stopped breathing, I rushed over, stooped down, placed my hands on her back and asked her what was wrong. It took time to sort through the mess of it all, how she was still on the phone and her younger son had just delivered the news that her 19-year-old boy had been killed in a car wreck. I sat with her while others emerged. People poured out onto the sidewalk wondering about the commotion. Pain like that can’t be contained and hushed up, quietly hidden away so as not to disturb anyone. Pain like that is what makes us reach out to other when they collapse under the weight of their own trauma. Store managers took charge of the practicalities, bringing her water, calling her boyfriend, covering her shift at work, calling emergency services to take her home. Then a young man walked down pushing his own infant son in a stroller. He cradled her face in his hands and told her to give it to God. We were eye-witnesses and onlookers to the worst moment of her life. My son squirmed in the stroller and reached out for me, not sure what to make of the scene. My daughter quietly looked on, staring wide-eyed at the stranger crying right there on the pavement. I reached out to reassure them and then asked if I could pray for her, and we brought the ugliness and the pain straight to Jesus. This woman I didn’t know looked up at me with eyes that held no hope. We can mosey about life thinking we’re doing okay or at least we’re pushing through, but when you’re knocked down onto the sidewalk, that’s what reveals the truth about us and the hope we’ve been clinging to. This world constantly mistakes hope for wishful thinking, anyway, and we toss around “hope” like it’s little more than a catchphrase or polite conversation. I hope you get that job. I hope it all works out for ya. But as Christians, we don’t have wishful-thinking-hope. We don’t have positive-thoughts-hope. 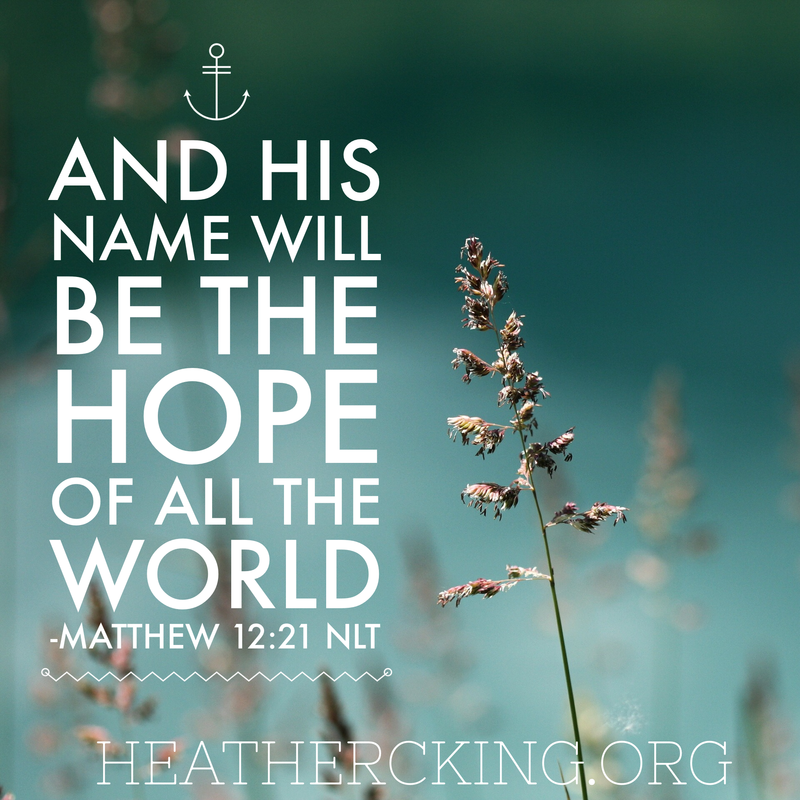 Hope has a name and that name is Jesus. of all the world (Matthew 12:21 NLT). Jesus gives us confident-assurance-hope. Because of Him, we have rock-solid-hope that God is with us and that God will save us and that God won’t abandon us. In her book, Brave Enough, Nicole Unice writes about the word “tharseo” in Scripture, how it’s used four places in the Gospels and each time it’s spoken by Jesus Himself. To a paralyzed man lowered down to Jesus by four friends who scaled a roof and took it apart in order to help their friend: “Take heart, my son;your sins are forgiven” (Matthew 9:2 ESV). To the woman who had been bleeding for 12 years: “Jesus turned, and seeing her he said, “Take heart, daughter; your faith has made you well” (Matthew 9:22 ESV). To the disciples alone in the boat out on a storm-tossed sea: “But immediately Jesus spoke to them, saying, “Take heart; it is I. Do not be afraid” (Matthew 14:27 ESV). To the disciples…and to us….”I have said these things to you, that in me you may have peace. In the world you will have tribulation. But take heart; I have overcome the world” (John 16:33 ESV). It’s Jesus we need. It’s in His presence we find courage, forgiveness, healing, and yes, we find the Hope we’ve been looking for. I tell my daughters about the email. Their teacher at church sent us information about an upcoming missions project. They’ll be collecting money as a class for a ministry in our area, but she doesn’t want the parents to just give kids money to contribute. Sure, I could stuff a few dollars and some coins into that empty container and send it in with my kids. And sure, they could hand it in and feel like they participated and did the good Christian thing that good Christians are supposed to do. But giving should cost something. In fact, giving should be costly. It should require some effort or sacrifice. We shouldn’t just give when we have more than enough. True generosity and true love require giving out of need and giving out of not-enough. My girls protest the fact that they have empty piggy banks, no allowance and no source of renewable income since birthdays only come once a year. So we return to our tried-and-true method: Extra chores allow them to earn money to give to missions or charities or ministries. The King girls will be sweeping floors and scrubbing toilets to earn those coins to give away. On Sunday morning, I hold the cup and bread in my hand and pray before Communion, thinking this is a lesson for me, too. I think about the cost of giving, the cost of generosity. Surely God has given generously to us. Maybe it’s complacency from long-term faith, from hearing those same lessons taught in the same ways. Maybe it’s selfishness. Maybe it’s forgetfulness. Whatever the cause, sometimes I cling selfishly to what I have and forget the abundant generosity of God’s gift to me. Could anything be more generous than grace? Yes, I mean the cross, but even before that. Adam and Eve stood in the aftermath of forbidden fruit and witnessed the ugly truth for the first time: Grace demands sacrifice. They sinned. They felt shame in their nakedness and they tried to fix things on their own, fitting leaves together to form a makeshift outfit. The Lord God made garments of skin for Adam and his wife and clothed them (Genesis 3:21 NIV). I’ve read that verse so often and just ran over the words without thought, but here’s the truth of it. They sinned. So God slayed an animal at their feet. He couldn’t just pick a few animal skins off of a store shelf or drop by the tailor’s so they could be custom-fitted with a faux-leather outfit. God handcrafted the clothes for His wayward children. Adam and Eve stood in the garden and watched another creature die for their own offense. They witnessed the blood running red for the first time ever. “God slays an animal. For the first time in the history of the earth, dirt is stained with blood. Innocent blood. The beast committed no sin. The creature did not deserve to die……….” (A Love Worth Living). Then they had to wear the result and remember the high cost of their God-designed outfit. It’s the act of a dad, helping a little one fit arms into arm-holes and socks onto feet. It’s tenderness and gentleness and love when they deserved wrath. and arrayed me in a robe of his righteousness (Isaiah 61:10 NIV). Right there in the garden it began: Outrageous, undeserved, generous, complete sacrifice of one life for another. I read Leviticus and wonder what it must have been like to watch the whole gory mess of atonement with its blood and guts and death. It became routine to the Israelites. How could that be routine? How could the stench and the bleating of the lambs become routine? 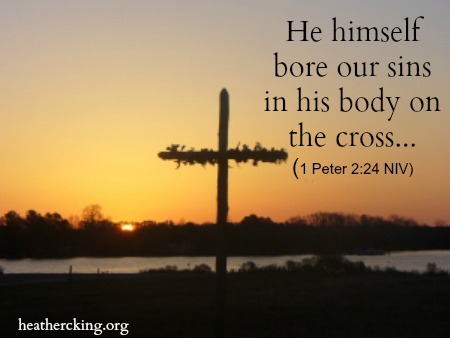 Yet, has the cross become routine to us? Grace should shock us all the more. Maybe if I had to stand and watch God pay the price for my mess with my own two eyes, I’d be less complacent and more overcome. Maybe if I had to let God silently drape my shoulders with a covering of His own making to hide my nakedness, maybe my heart would break with sorrow at my sin. Maybe if I watched someone die in my place, knowing how little I deserved it, I’d learn what true generosity is: giving abundantly and without complaint even when it’s undeserved and even when it costs me dearly. The truth is that Jesus did just that: He died for us and then He dressed us in His righteousness. May we be overcome by grace anew.